For Comiket 78, Hato Rami released two illustration doujins, both individually sold. STAR★DUST is the less expensive of the two and is composed entirely of fan art illustrations from past Hato no Tamago releases. Inside, there's a mix of illustrations from Black Rock Shooter, Rozen Maiden, Fate/Stay Night and more, selectively chosen for this compilation. Unlike many of Hato Rami's releases, STAR★DUST is A4-sized, staple-bound and not printed on textured pages---all of which are welcome changes. 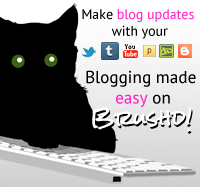 Quality levels are maintained, as the print quality is still excellent with barely visible noise. 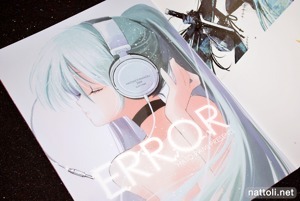 The book starts out with the Black Rock Shooter illustrations from her Winter 2009 Comiket release Shooting Star. However, the cover Black Rock Shooter illustration is new to the book. 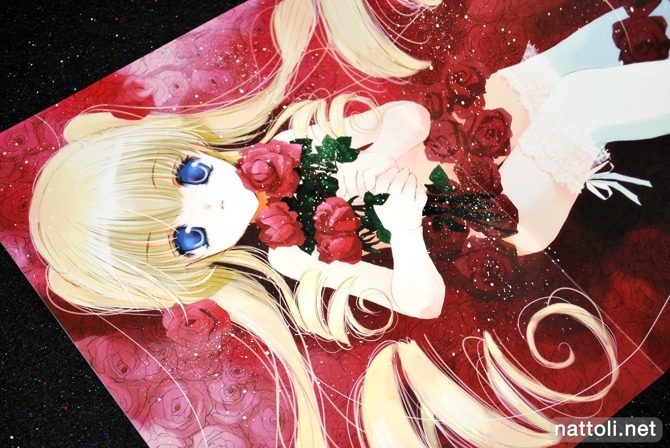 There are several Rozen Maiden illustrations included; two featuring Shinku receive a full-page and a two-page spread. Suigintou and Kirakishou are also pictured on a split page illustration. 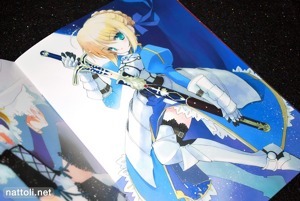 Also included are two older illustrations featuring a very feminine looking Saber from Fate/Stay Night. STAR★DUST is the smaller of Hato Rami's two C78 releases with 16-pages in total. But every single "page" has an illustration in here, so covers and inside covers are truly used as pages. A couple of the other older illustrations included are from Gundam Seed Destiny and Neon Genesis Evangelion, pictured above. I haven't seen the one with Shin and Stellar before, but Hato Rami does a great rendition of both characters. The last illustration is the group art work of the K-ON! girls, made for the short booklet from her C76 release. It was initially a two-page spread in the other book, so it's kind of sad it didn't get a bigger display in STAR★DUST. This doujinshi can still be purchased through Toranoana, so it can be an easy acquisition if it interests you! Fingers crossed hoping to get this! I was holding out until a review!